Great price. Can't have too many magazines. Christmas present for relative who has the pistol. It is the brand name and I need more magazines for my Bodyguard, good price. Extra mags for both practice rounds and protection rounds. Great price on factory mags for the Bodyguard 380! 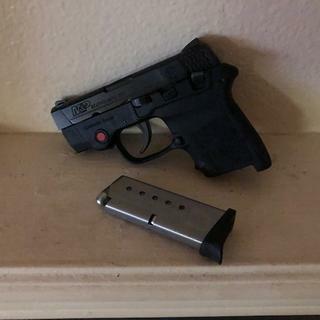 Need additional mags for S&W M&P Bodyshield .380. I have a SnW Bodyguard and this is a great price for the magazines. Less than half of what I can buy them for locally. Lowest Price I could find other than Ebay. Because I only have 3 magazines for my bodyguard. ! And I usually try to have at least 4 per auto ! This gun and mag work like a well oiled machine no complaints. Awesome price and fast delivery for a factory magazine. None of the local shops could evwn come close to the Grabagun price even with shipping added. Thanks Grabagun. I am a very satisfied customer. Best prices on factory equipment...who could ask for more? I saw these come up with a ridiculously cheap price. So I bought 4. I soon realized the price was likely a mistake and figured GAG would not honor the order. I was wrong. The magazines arrived and the price was as advertised. What a great, honest company. What can I say, factory mags at a great price! These are quality magazines at a great price! Great fit for your pocket and very accurate as well. Love the S& W Bodyguard 380! Great fit for your pocket and very accurate. Works flawlessly as a factory made magazine should. Should have bought more at this price. Got from here because of the great price. Unfortunately it took three weeks to get this item.. Original in box. Factory perfect. S&W makes the magazines perfect and Grab a Gun sells them at the perfect price. Bought 3 of them and I am very happy with the whole buying experience. Keep it up Grab a Gun! New original S&W Bodyguard 380 ACP 6-Round magazine with Finger Rest in original packaging. Good deal and brand new. Always good to have spares. Work like the ones that came with the firearm. Didn't expect them not to as these are original S&W in package with one Finger Rest and one flat. Add more than one to your cart and remember grab some ammo with flat rate shipping.